1,018 Brands Disclose Their Holiday Ecommerce Plans: How Do You Stack Up? There are plenty of online articles out there – heck, we even ran one – where industry experts and influencers advise of which seasonal marketing strategies online brands and ecommerce marketers should use to ensure their store gets a fair share of the holiday ecommerce revenue. No advice compares to that coming straight from ecommerce business owners and marketing managers themselves. These are the people in the trenches. And ultimately, the most innovative and successful of what they do this time of year is what the industry experts and influencers will recommend next year anyway. So, we decided to go to that source – and survey more than 1,000 online business owners, ecommerce managers and brand marketers on what they are planning and expecting for the 2018 holiday season. So, without further ado, here is what 1,018 brands reported they will do for the 2018 holiday shopping season. Nearly 57% of brands surveyed (56.88%) see their sales spike in Q4 – likely due to a seasonal uptick in consumer purchasing for the holidays. Q2 is the second most-reported high sales quarter, accounting for Mother’s Day and the pre-summer season. 15% of brands report no seasonal change in sales throughout the year. Brands that don’t experience seasonality tend to sell B2B or products like office/industrial equipment. While 57% of brands reported Q4 as their typical high sales season, 88.65% of brands expect to see an increase in revenue this holiday season, illustrating the optimism many merchants feel heading into what will likely be the largest online shopping event in history. Nearly 40% of respondents expect to see a more than 25% increase in sales. 5.4% expect to see a more than 100% increase YoY in holiday sales in 2018. Here is how the data breaks down, showing the percentage of respondents who expect to make more than a given % in YoY holiday revenue for 2018. Nearly 53% of brands (52.68%) report they began holiday campaign planning for the 2017 season in Q3 – 21% of them in September. But October ranked #3 as the most popular month brands began holiday campaign planning in 2016, behind September and August. So, did 2017 work out? Did these brands learn anything from their experience last year that caused them to change course as they prepare for the upcoming holiday shopping season? Seems like at least 37.52% of them did – with those reporting they began holiday planning 1-4 months earlier in 2018. Here is how the percentages break out for how brands changed (or didn’t change) their holiday planning timeline in 2018. The measurement of campaign success is vital to understanding how and if the holiday campaign planning and stress is even worth it. More than that, it is vital to understanding which campaigns and tactics actually worked – and which can be scrapped for next year. 65.8% of respondents rely on their BigCommerce Analytics + Insights to provide data understanding of what worked, what didn’t and for which customer segments. Google Analytics is also popular with the survey set (whom were allowed to choose multiple tools they use), with 61.55% of respondents using Google’s platform. This has been a big year for press about retail store closures. The survey highlights that these headwinds are mostly impacting old, legacy retailers and not today’s more modern, nimble brands which continue to grow and hire. Instead, the survey data we found aligns with industry data that shows ecommerce is not killing retail job growth, but moving that growth into other areas outside of brick-and-mortar stores. Nearly 29% of ecommerce businesses plan to hire additional staff this holiday season. Just how many? Here’s how that breaks down. What will the vast majority of these seasonal workers be doing? Fulfillment. Here is where hiring allocation will be distributed. For the “Other” category, manufacturing was the primary hiring allocation call out. Traditional retail channels like your branded site or brick-and-mortar store still dominate holiday purchases, but marketplaces like Amazon and social media channels are gaining traction. For the “Other” category, markets and fairs made up the majority of responses. OK, but what about marketing & advertising channels? Great question – and BIG news! Facebook has usurped holiday email campaigns as the primary channel expected to be successful for holiday marketing campaigns. Oh course, it hasn’t usurped it by much! Google Shopping, SEO and Instagram all come next. Selling on Amazon and Word of Mouth marketing were the two primary manual entries for the “Other” category. 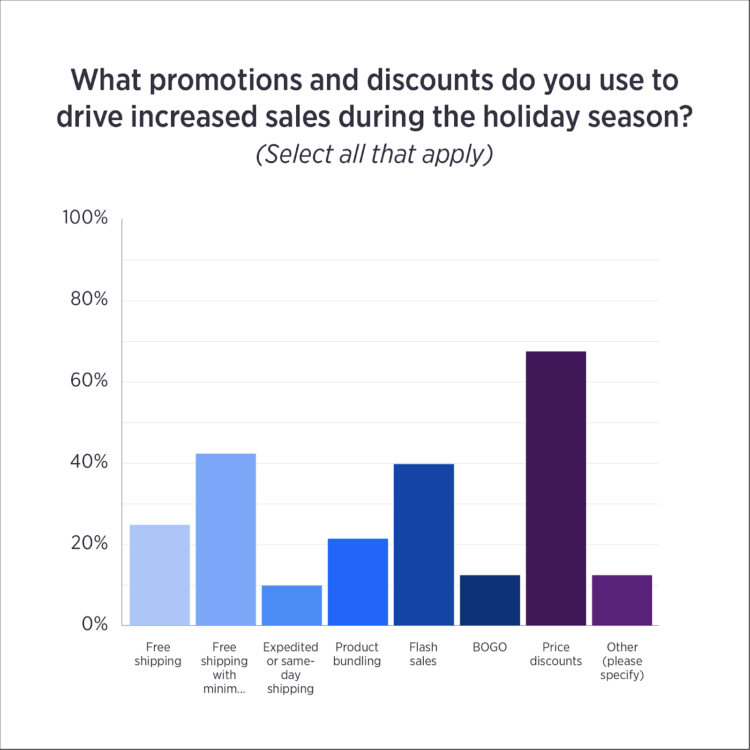 78.67% of brands plan to use promos and discounts to drive up holiday sales. Gift with purchase made up the majority of the “Other” category. Alright – so now that we know what, when and why brands are planning – let’s have a look at what keeps them up at night. We know Black Friday is the highest web traffic day of the year – and for the past 3 years, it’s been the highest web traffic day in history (with no signs of slowing). There’s a lot riding on that day. You need your site to stay up. You need your checkout to work. You need to have inventory available and you need to be able to get it out that day. It’s one thing to run a successful campaign, and another to make those purchasers happy customers. And brands have all of these things in mind. Here’s how the percentages break down between what is causing them the most concern. AmazonS fears make up the majority of the “Other” category. As told to BigCommerce by Bryan Keaty, Digital Solution Manager, RANDEM. Since March 2018, we’ve been working on an omnichannel sales turnaround for Kidstuff, a premium children’s toys and education retailer with 60 stores around Australia. The key challenge in April 2018 was an ongoing downward trend in store footfall and revenue conversion when compared with 2017; while online their traffic was steady at 78,000/month but customer engagement and conversion were low in comparison to market benchmarks. RANDEM worked in partnership with Kidstuff executives on a “Christmas in July” concept which we rolled into a coordinated campaign across both in-store and digital channels with sustained execution across June and July 2018, a typically quiet period in the toy market. However, given the general seasonal downward trend in performance and what we’ve historically seen in terms of customer engagement in these types of promotions, we knew more was needed to achieve a lasting turnaround. It was agreed the key was to focus on the brand’s key messaging “providing a foundation of learning through play” to drive a substantial, broad-based uplift in customer engagement – both in-store and online – reinvigorating and changing the perception of the Kidstuff offering. Online chat availability from 10:00am to 10:00pm, further supporting brand messaging and providing practical assistance in areas such as product information and real time in-store stock availability. Foot traffic increased in store by 18%, driven by the increasingly “personal” relationship. Increase in revenue online of 49% from April. The launch of the “Christmas in July” offer was coordinated across instore and online with marketing and merchandising materials prepared in advance and displayed in store. Analyzing and executing on the exact timing of marketing messages to capitalise on expected Daily/Weekly spikes in customer availability. Foot traffic increased in store by 5%, driven by coordinated in-store and digital marketing. 20% overall increase in revenue; across all channels. Increase in engagement in on-site chat by 429% from April. Executed in what is usually a very quiet time of the year for the children’s retailer, this coordinated promotion across in-store and online channels has substantially increased excitement and brought awareness back to the core brand message. The immediate results are a real improvement in customer engagement with the brand – with consumers arriving in-store and online more ready to convert – leading to sustainable revenue increases. However, more importantly, it has laid a foundation for Kidstuff to build a solid platform of engaged customers in preparation for the crucial “Real Christmas” season which kicks off from September. Proper planning and execution are the name of the game when it comes to holiday campaign success. Failing to do so can also mean losing out on major profits during the highest online shopping time of the year. Planning earlier, and even running campaigns throughout the year to flex your integrated marketing campaign muscles are both good ideas as you prep for the holiday season.